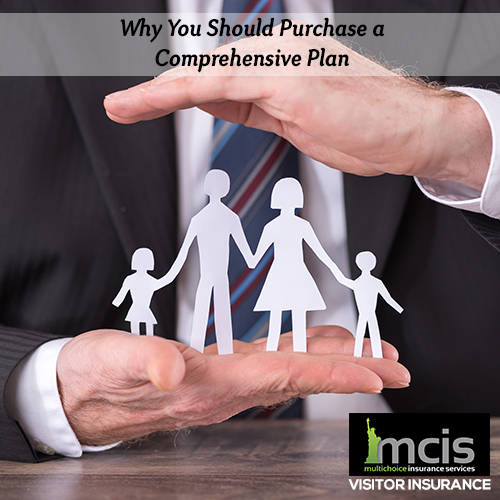 Why You Should Purchase a Comprehensive Visitors Insurance Plan! When visitors set out to buy visitor insurance for their upcoming trip, they have different plans available to them. These plans differ in their coverage and cost. But one of the major difference in them is that they may belong to two different categories. A visitor may either opt for a Fixed Coverage plan or a Comprehensive Coverage plan. Experienced agents in Multichoice Insurance Services recommend purchase of a Comprehensive Coverage plan. Let’s understand their differences and why we recommend the Comprehensive ones. There is a pre-scheduled amount set for any medical benefit a visitors seeks. Beyond this amount, it is the responsibility of the visitor to pay out of his pocket. For most of the plans, there is a per sickness or per injury deductible which needs to be met before any medical service is sought. For example, for each visit, a visitor needs to meet the deductible before the insurance plans starts paying. After the deductible is met, the plan pays a fixed dollar amount for each medical service. This is all pre-defined in the policy. A visitor can visit any doctor/medical caregiver or any hospital. He is not restricted to any kind of provider network. There is no protection against baggage loss, trip delay and trip cancellations. Unlike Fixed Coverage Plans, Comprehensive Coverage Plans has one-time deductible. Once this deductible is met, the insurance plan has 80/20% coinsurance for the next $5000 (for a lot of plans). It means the plan pays 80% of the expense till certain amount and thereafter pays the entire 100% upto policy maximum. Comprehensive Coverage Plans have provider network. This means the insured person can select from doctors and hospitals in the approved provider network. This way he avails the discounts and benefits of the provider network. These plans offer non-medical travel related coverage like trip interruption and baggage loss. Which one to choose, Fixed Vs. Comprehensive? When a person is buying a visitor insurance plans, first and foremost thing is to understand what coverage is offered by the plan. But most of the people are concerned about the cost only. This is not the right approach towards buying a visitor insurance plan. Based on the features mentioned above, we recommend purchasing Comprehensive Coverage Plans. They are of course costlier than the Fixed Coverage Plans but provides better and more comprehensive coverage. Imagine, a visitor buys a Fixed Coverage Plan for his international trip. He pays low premium. One day he meets an accident or when he is in need of a medical service, he uses medical facilities which are way more expensive than his home country. Since he has Fixed Coverage plan, the plan only pays certain fixed amount per injury/sickness and rest is his responsibility. So by paying low premium and choosing a plan which is not comprehensive, he ends up paying a big medical bill. If he had a comprehensive plan, he would have paid more premium but was covered far better and have to only meet his insurance plan deductible. So, it’s not the cost which is the most important factor when it comes to choose the type of visitor insurance plan, rather it is the benefits that a plan offers when there is a real need. Moreover, a visitor who is planning a trip full of adventurous or extreme activities should opt for a Comprehensive Plan for better and broader coverage, available with optional riders. To choose from an array of different Comprehensive Plans, speak to an MCIS agent today and select a plan that suits your travel and health needs. We can be reached at contact@multichoiceinsurance.com or call us at +1-855-444-6247 and +1-510-353-1180.